I am always a believer that my being is a work in progress. Even though most people expect so much from me, perfection is not in my vocabulary. I am not afraid to commit mistakes because after all , mistakes are just lessons to be learned. Needless to say, I always make sure that each day I live my life in the most audacious way one could ever imagined which includes thrilling escapades. 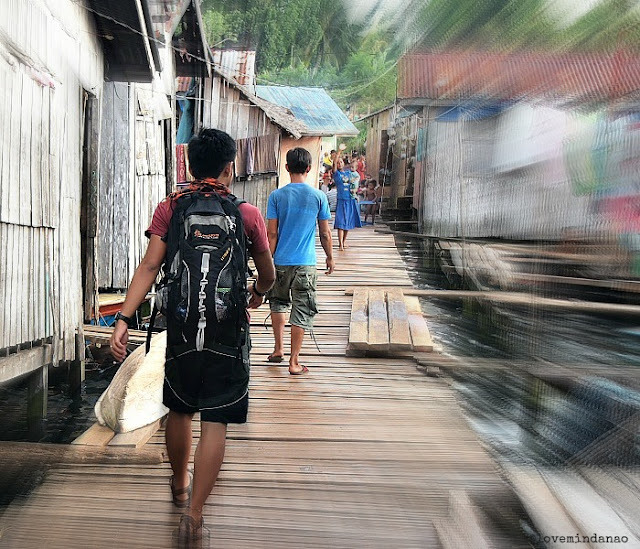 This adventurous side of me led to challenge myself to visit the farthest province in the south of the Philippines, part of Autonomous Region of Muslim Mindanao (ARMM), Tawi-Tawi. As expected, the thought of traveling to the south hailed much negative criticisms and reactions from friends and family. It is just sad that the sensationalized news, rumors and speculations of unstable resilience in the region has become the basis of most people think from Luzon and Visayas of what Mindanao is. This has jeopardized the tourism potential of the region especially the Province of Tawi-Tawi whose geographical location is just below Basilan and Sulu. Coming from Manila, I stayed overnight in one of the cheap hostels in Zamboanga, the country’s Latin City before taking Cebu Pacific Airline bound for Sanga-Sanga. Flights to Tawi Tawi is scheduled only every Sunday, Monday, Wednesday and Friday. From Zamboanga City, I arrived in Sanga-Sanga Airport the next day pass 7:00 am not knowing what was in store for me during my holiday trip in this strange land. After a sumptuous unique breakfast in Kahapan Street, our first stop was the Sanga Sanga Bridge where I got to witness the children fearlessly jumping over the bridge fronting the Tungkalan Beach. It was a surreal scene to observe! 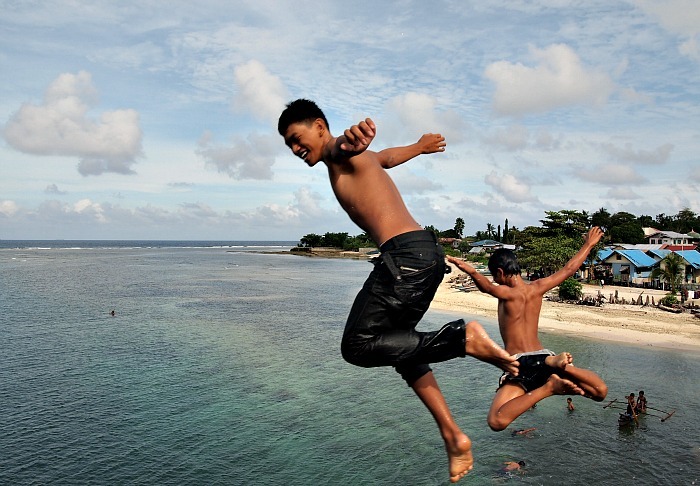 This seems to be the training ground of young Tawi Tawians in swimming and diving activity. We also took a short stop at Sand Bar Lepa Resort in Pasiagan where you could find the best impression of the wide Celebes Sea with the picturesque iconic Bud Bongao perfectly sitting at the background. The place was heavily accentuated with white fine coral sands that are very much common elsewhere in the island. We then rode heading north towards the boundary of Bongao and Panglima Sugala. We were blessed with a very beautiful weather and driving a motorcycle was just perfect to see almost everything on the country side. Listening to Michael, I learned that the road which connects the two municipalities (Bongao & Panglima Sugala) has just opened last July 2012. 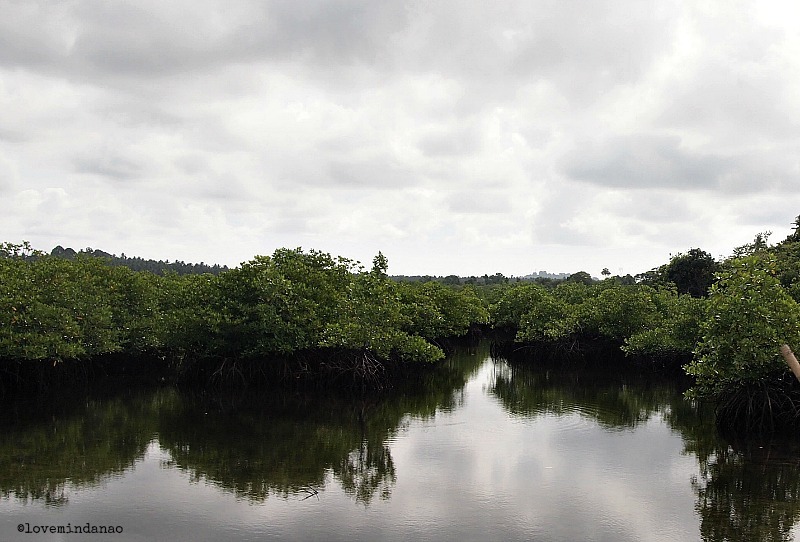 In between the two islands was a brackish water body with a lush green mangrove ecosystem. The unspoiled habitat was truly a breather from the stressful concrete jungle of the metro. Though development is in queue, the place was still surrounded with striking view of unique landscapes with Bud Bongao standing perfectly in the south with lush mangroves on the riverside and gazillion coconut trees found on the hillside. The sudden grumbling of our stomach brought our inter-island wandering to a standstill. We rode back to the town proper where my host prepared a sumptuous authentic Bongao dishes that I have never tasted before beside from the Agar-Agar which was the closest to familiarity. 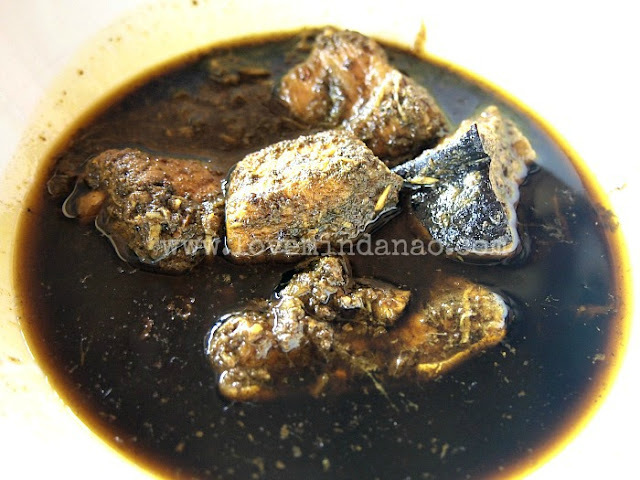 The coconut and hot pepper were the most beloved ingredients of local culinary as most of the dishes were cooked in coconut milk and burned grated coconut meat giving the dishes an exotic blackish olive appearance with blazing spices. How Much for a Dream? After getting knocked down by the spicy delicious lunch, we continued on our quest for the unique southern ‘tepo’ or mat weaved by the Badjaos. The intricate unique design of the tepo was believed to have sourced from a woman's dream. 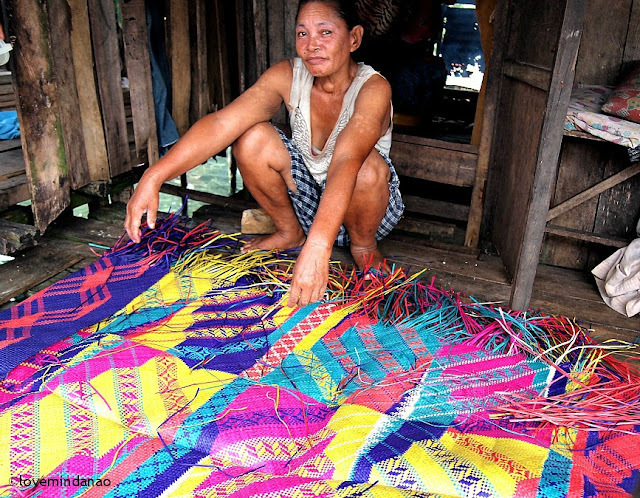 It was a very fortunate day for me to witness the actual weaving done by a Badjao woman. The tepo was a great and priceless souvenir that I will surely display on my wall. This woman has all the right to be proud with her half-finished master piece mat or known as tepo in Sinama. It was like reliving a high school life when I suddenly felt the urge to do something nice and unthinkable. 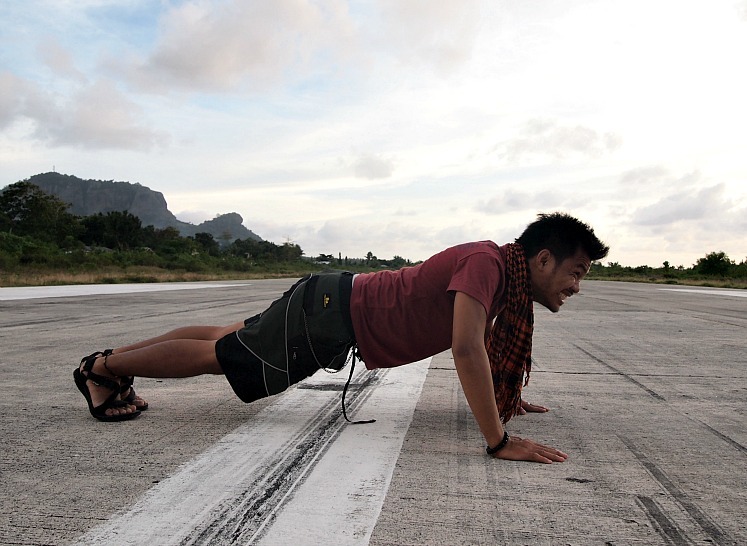 Spontaneously, I decided to heed towards the deserted airstrip of Sanga-Sanga Airport in Tawi-Tawi. Be spontaneous, do crazy things!- at the airstrip! Generally, unauthorized personnel are not allowed in the runway of the airplane for safety purposes. But upon seeing an entry point to the side of the airstrip, I invited myself in and wandered on the vast concrete pavement suited for an aircraft. Amazed by my own presence in the vicinity , I ran and did some push-ups, tumbling and even played like a drag racer on a motorbike on the airstrip. Spending a great time alone I did not realize that the sun was already about to set and I decided to end my first day in the island. I have thought that everything was a dream waking up in this part of the Philippines and I guess the fact that I have ticked one of the items in my bucketist still didn’t sink into my head. But honestly, I have no idea what to do next in Tawi-Tawi. As mad as Captain Jack Sparrow, I decided to climb the iconic Bud Bongao ALONE! So, without wasting a single minute, I packed my bag and hit the road towards the jump off point of Bud Bongao. It took me a great effort climbing the highest peak in the island. The view on the top paid off the hardships and it was one exhilarating experience in Bud Bongao to possibly discover new species of Aroid. Just wow! Tired and sweating after my trek to Bud Bongao, I found myself walking through a pavement leading to a traditional Muslim wedding ceremony. You are one lucky guy Nurjay ! I was so fortunate that I was invited to witness this grand celebration in Bongao. It was the union of hearts of the two sweethearts of the island, Nurjay and Fahda. The ceremony was simply solemn and far from the other wedding ceremonies I have attended before. So much things have happened in this day but my feet was so itchy that I decided to roam around and look for something else to do. Slowing me down seems impossible as I really wanted to maximize my stay in this paradise. Driving through the National Highway of Bongao, we passed by a deserted shore known as Siligad, and with the sun already setting down, my playful mind succumbed me to get a taste of the beach life in Tawi-Tawi. Discontented with just dipping into the cool and crystal clear water, I took off all my clothes, (now on my birthday suit) and swam towards the deeper part of the beach. The hell I care! I took a quick scan of the surrounding and knowing no one was around, I played just like a carefree and innocent child in the wild. It was a bizarre experience! 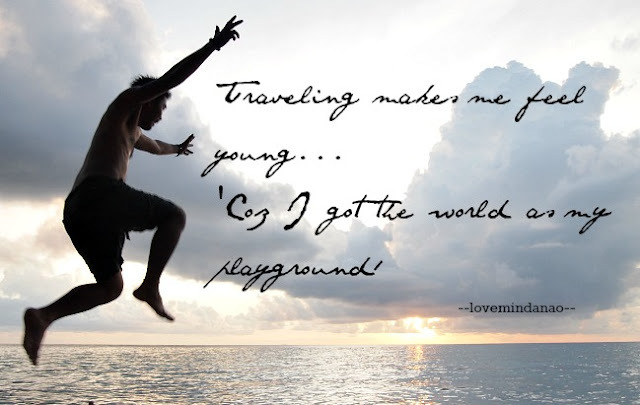 The thought of having the world as my playground, giving me an ecstatic feeling of extreme bliss. Oppss maybe too much. After the crazy and daring activity at the beach, I thought it would just be fitting to reward myself with my favorite thirst quencher (RH). I reckoned the best place to consume it and there was no better place than at the tip of the Provincial Capitol where I have a complete panoramic view of downtown Bongao. Picture this, it is almost sun set and the breeze was just alluring to calm one’s mind, then you are sitting at the rooftop of the highest political seat in the province, holding your favorite drink on one hand. It was just perfect! What a way to end my second day in this paradise! All good things must come to end! I was scheduled to leave the peaceful island of Bongao on the 3rd day and I felt a little hanging in the air as I couldn't believe that I was set to leave from this peaceful place. Was that just luck or it was the goddess of surprise that I bumped again with the newlywed Nurjay and Fahda in the airport, who were set to leave for Zamboanga City for their civil rite. At the same time, I was so fortunate to rub elbows with Tawi-Tawi’s political power house family where I was even given with some souvenirs by the Province’s first lady. My deepest gratitude to the people of Tawi Tawi for the warm welcome and hospitality during my very short yet reflective stay in your beautiful province. breathtaking naman sa Bud Bongao na 'yan. nice shot. Thank you for this LM. I just hope people outside tawi-tawi would have a better glimpse of our place when they read this. Hoping too that this would give those people who are clueless about Mindanao a reason to see our region in a better and bigger perspective and not just focus on the sensationalized news they have seen on tv. wow! tawi tawi's beautiful. im from mindanao but i never been to armm region. This is a great read! 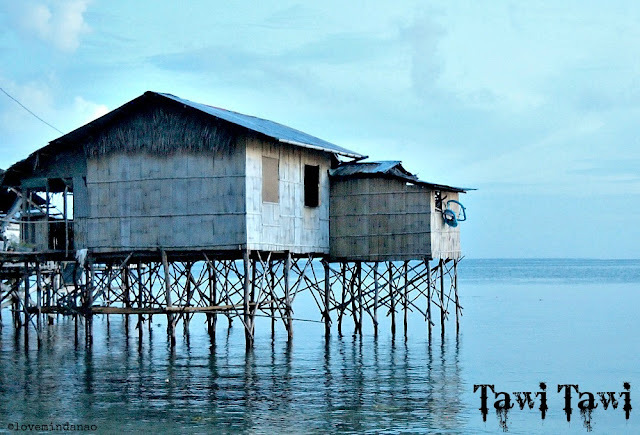 Tawi Tawi is definitely in my must-see list. So far the farthest I've gone is just to Zamboanga. I miss TawiTawi so much. 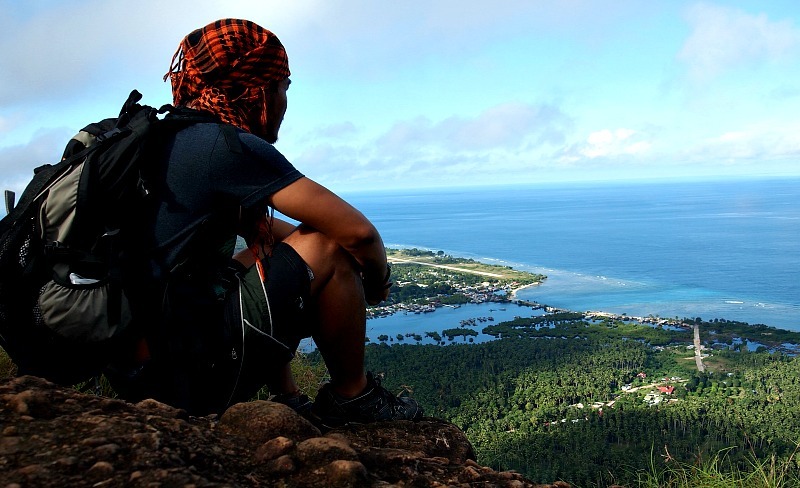 Whoa, the view from the peak of Bud Bongao is just so breathtaking! What an amazing experience you had in Tawi-tawi sir! You know, I booked this flight to Tawi-tawi too for late this year and I am going alone. Your story is giving me a feeling that I am going to be okay exploring this beautiful paradise in Mindanao. Thanks for sharing!